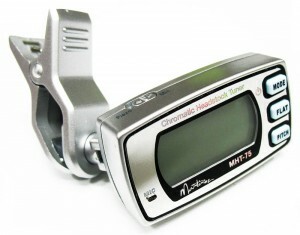 Always play in tune with this little chromatic tuner. It clips on to the headstock of your instrument or music stand allowing you to tune up in seconds. Works on all guitars, search electric, order acoustic, clinic classical or bass. Backlit red panel, changes to blue when in tune! This entry was posted in Accessories, Gizmos & Gadgets and tagged bass tuner, chromatic tuner, guitar tuner, headstock tuner on February 11, 2009 by allan.